Lotus Elite revealed | What Car? 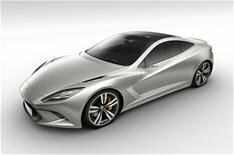 Lotus will launch this stunning, super-fast Elite in the spring of 2014 to rival the Aston Martin DB9. Expected to cost from around 115,000, the 2+2 supercar will use a 5.0-litre V8 which, when matched up to an optional hybrid system, will develop more than 600bhp. Lotus is targeting a 0-62mph time of 3.5 to 3.7 seconds, a top speed of 196mph and CO2 emissions as low as 215g/km for the hybrid, nearly half the output of the 389g/km DB9. As well as a straight coupe, Lotus says the 2+2 will have a 'slick retractable hard top', although it's not clear whether this means a full convertible or a Porsche 911 Targa-style arrangement.